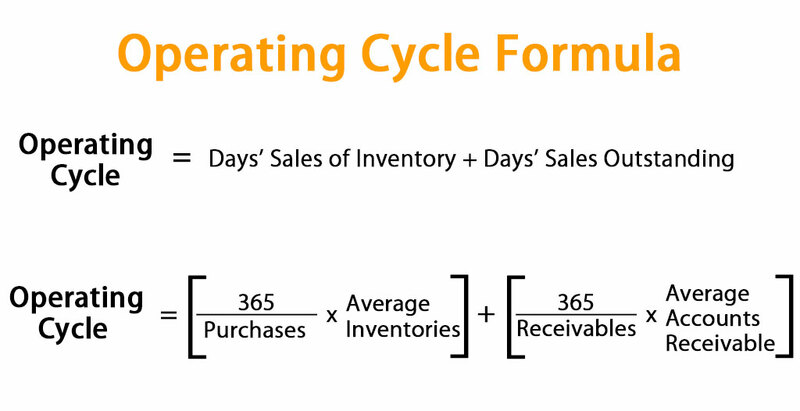 Operating cycle of a particular company can be termed as the number of days required to turn its Stocks (both Raw materials and traded goods) into cash. It starts with the process of purchasing Raw materials to manufacturing into processed products and packaging, distribution and Sales and finally a collection of cash against Trade receivables. Days sales of inventory equal to the average number of days the company takes to sell its stock. Days sales outstanding on the other hand is the period in which receivables turned into cash. 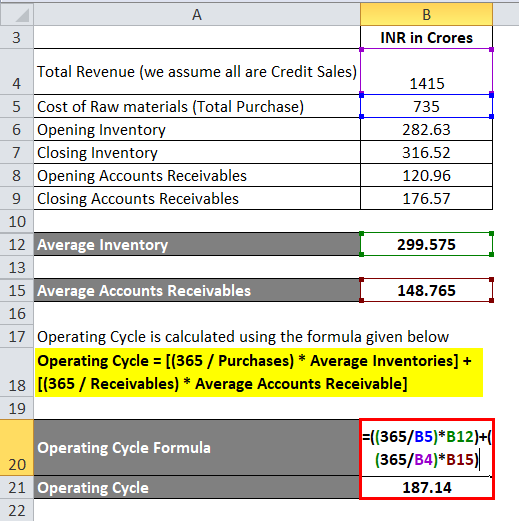 Let’s take an example to understand the calculation of Operating Cycle formula in a better manner. From the given data calculate the operating cycle of ABC limited. Thus, the company takes 37.2 days to convert its inventory to cash after Purchasing Raw materials, Manufacturing, and processing into finished products and selling them in credit and collecting cash from the Debtors. From the following data of VIP Industries, Find out the Operating cycle of the company so as to understand the Operating efficiency of the Company. Thus, the company takes 187.14 Days to convert inventory to Cash. From the following data of Page Industries, Find out the Operating cycle of the company so as to understand the Operating efficiency of the Company. 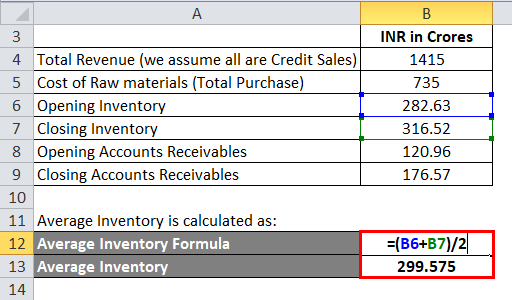 Thus, the company takes 218.8 Days to convert inventory to Cash. Operating Cycle can be summed as the total number of days within which raw materials are purchased, processed and manufactured into an end product or inventory and sold via a distributor and the amount realization days is being taken into account together. Cash -> Raw materials purchased -> Manufacturing process -> Work-in-progress -> Packaging -> Distribution-> Sales -> Bills Receivables -> Cash received. In other words, operating cycle is the operations prevailed in between cash to cash primarily in a manufacturing business where there is a purchase of Raw Materials, manufacturing with the help of labor, machinery, and land (assets) and converting it into the desired product. Then the product is sold via distributors on credit and later after a specific number of days the amount is collected from the debtors. 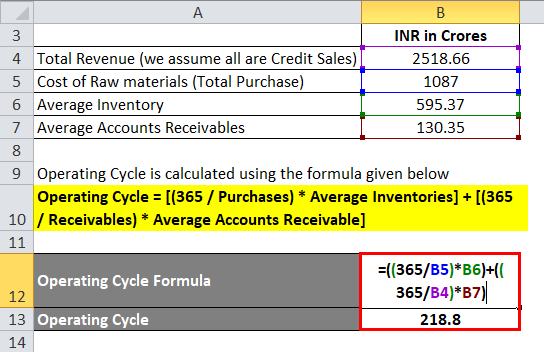 Calculating Operating cycle helps the management, to understand the situation of Cash inflow and cash outflow in relation to inventory in, and inventory out. The relation between Debtors, creditors, and cash with purchase and Distribution can be evolved from the above formula. 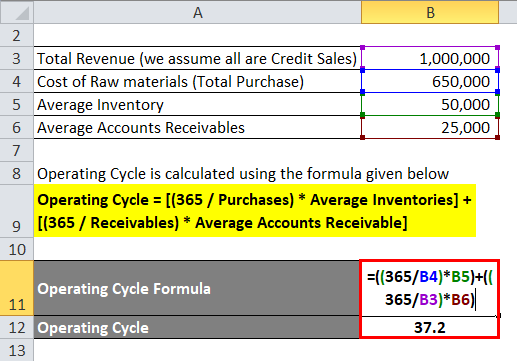 The number of days which is taken by the company to turn Raw materials in cash is the primary data one can get from the Operating Cycle formula. Debtor outstanding days is often regarded as one of the major tools to analyze the product demand and the importance of the particular product compared with its peers. In a credit sale, the cash is not received immediately, it is received as per the contract made with the distributors or retail shops. They generally make quick payment when there is a good demand for the product from the consumer’s end and vice versa. Inventory days is also an indication of stock movement which happens inside the company. A lower debtors’ days is what every business want. It means the products have the capability to satisfy customers need and the distributors are churning the products more frequently than the industry which is also a positive indication of higher demand of the particular product in its category. You can use the following Operating Cycle Calculator.